The Oscars will air live on Sunday, February 28, on ABC. 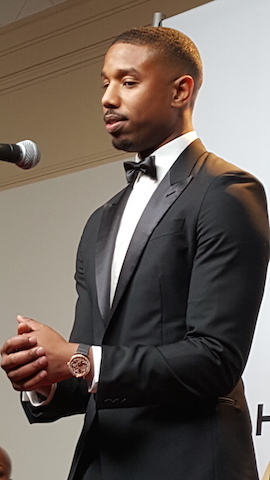 He was snubbed of an Oscar nomination for his brilliant turn as Adonis Creed in the Rocky sequel “Creed,” but is one of several black actors who will present an award at the Oscars this month. The young actor, along with Common, Louis Gossett, Jr., Whoopi Goldberg, Kevin Hart, Kerry Washington and “Beasts of No Nation‘s” Abraham Attah are all slated to present awards at the 88th Oscar ceremony. When the Academy of Motion Picture Arts and Sciences announced its 2016 Oscar nominees last year, only white actors and actresses were among the chosen few in the top four categories. This resulted in the resurgence of the social media hashtag #OscarsSoWhite. Now the Academy is scrambling to ensure diversity is represented by adding more black entertainers to its slate of presenters. “Through their work, these artists have shown us the unique, transformative power of cinema,” said producers David Hill and Reginald Hudlin. “We are delighted they will be joining us on the Oscars stage this year. The Oscars, hosted by Chris Rock who returns to host for a second time, will air live on Sunday, February 28, on ABC.